Valentine’s Day is a lovely holiday in which we get to shower the ones we love with gifts, chocolate, candy, and other kind, caring, and possibly romantic gestures. You may also take part in fun romantic activities or getaways with your family or partner in crime. Whatever you end up doing on Valentine’s Day, what’s most important is that you’re spending time with the person or people in your life that you care about the most. For kids, Valentine’s Day might not be centered around one romance, but instead focused on showing love and kindness to everyone they care about. They may be asked to bring goodies into their classrooms along with cards and other things. If you don’t want to have to spend a fortune on these gift bags and treats, you’ll love these DIY Valentine’s Day crafts and homemade cards for kids. Since your child will also likely be bringing goodies home themselves, they’ll need somewhere to put them! Check out our Valentine’s Day box ideas for creative storage ideas that are easy to make. For those of you that love the colors of Valentine’s Day like I do, you’ll probably want to deocrate your house for Valentine’s Day as well! 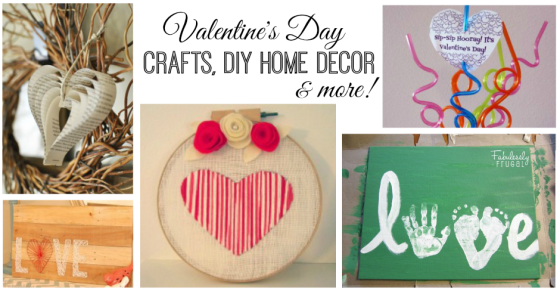 Making your own DIY Valentine’s Day decorations is fun, frugal, and rewarding, so we highly recommend it! We’ve got many ideas for you to try too like our DIY Valentine’s Day Wreaths, Love String Art Sign, and our DIY Embroidered Heart. For more ideas, browse the posts below!